Villa Wayu welcomes vacationers with its Thai-inspired living spaces, picture-perfect beachfront setting and landscaped lawns. Direct access to the beach, sweeping sea vistas and impeccable service are some of the highlights at the villa. Featuring seven bedrooms, as well as a kid-friendly bunk room, Villa Wayu is a great option for large group getaways with the entire family. All seven bedrooms feel cosy and inviting, thanks to the addition of plump pillows, quality linen, sofas and warm lighting. En suite bathrooms, mini fridges, air conditioners, ceiling fans and TVs are facilities common across all bedrooms. An additional kid-friendly bunk room features three bunk beds, a twin bed, en suite bathroom and Wii game console. A sparkling swimming pool, filled with mineralised water overlooks Mae Nam Beach. Surrounding the pool are an expansive lawn and patio area - all of which are elevated over the beach to provide privacy and uninterrupted views out to the sea. By the poolside sits a covered sala, which comes fitted out with a dining set that seats 14, outdoor barbecue facilities, a bar fridge and surround sound speakers. Loungers are scattered all around the lawn, inviting vacationers to sit back, relax and take in the magnificent vistas! 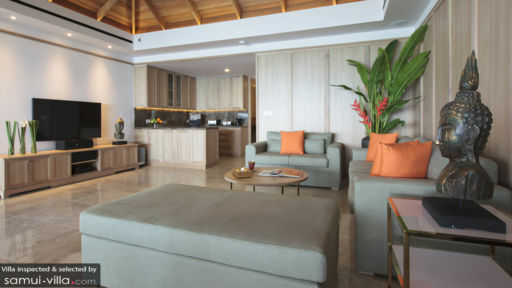 Each of the living spaces at Villa Wayu are light-filled, spacious and well-appointed. The main living area boasts a dining table for 14, a wall-mounted flat screen TV and plump sofas. A fully equipped western kitchen provides access to a Thai-style kitchen, where your personal chef prepares delicious in-villa meals. Spread out across the ground floor are facilities like a multimedia room, outdoor massage sala, sauna room and fitness centre. The kids aren’t left out in this family-friendly property - they’ll have their very own living area complete with a 40-inch flat screen TV and en suite bunk room. Villa Wayu is a full-service property with housekeeping and butler availability, as well as a concierge, private chef and security services. A roundtrip airport transfer is included with your stay. Services available at additional cost include villa pre-stocking, beverages, customized meal options for in-villa dining and travel excursions. 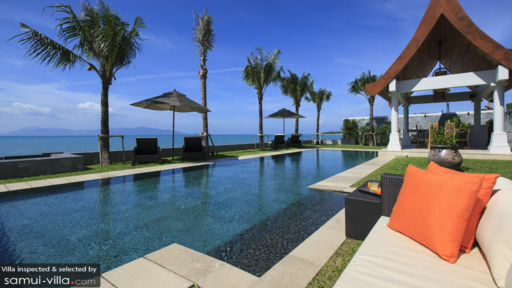 Villa Wayu is located along the coasts of Mae Nam, a coastal town in North Samui. Here, you’ll find a beautiful white sand beach, myriad dining establishments, mellow nightlife scene and a variety of attractions suitable for the whole family. In addition to family vacationers, Mae Nam also lends itself to holidaymakers seeking to unwind at a laidback destination. You’re just steps away from the beach, restaurants and Mae Nam walking street, a bustling outdoor market that takes place weekly on Thursday evenings. You’ll find stalls selling myriad goods and street food, as well as mobile cocktail carts. Peppered all around town are a wide-ranging array of restaurants and cafes - from homely venues serving up delicious baked goods and breakfast sets (Angela’s Diner), to seafront establishments (Zazen Restaurant, Nature Bar) and elegant fine dining venues (PASSA, Taksin Lounge). In your free time, lounge by the beach, join in a yoga class at The Yogarden Samui, indulge in exquisite spa rituals at Belmond Napasai or learn the basics of Thai cooking at Island Organics. Of course, these activities are also available as in-villa experiences - just ask your villa manager for further assistance and details! The Santiburi Samui Country Club, located a quick drive from your villa offers a golf course, tennis courts and exercise facilities.